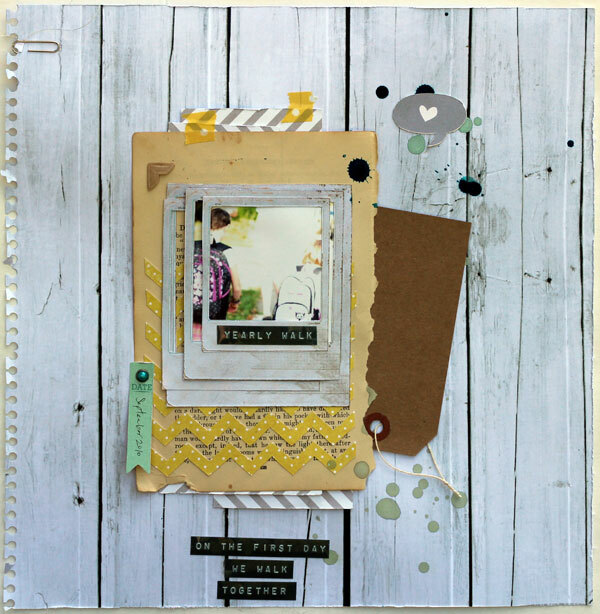 I made this for the My Mind's Eye blog challenge to use handcut elements, cut from their paper. I cut chevron zig-zags from the yellow and white chevron paper from The Bright Side. I used the polaroid frames from Follow Your Heart "Be Happy" and cut them apart, and cut the blank centres out. 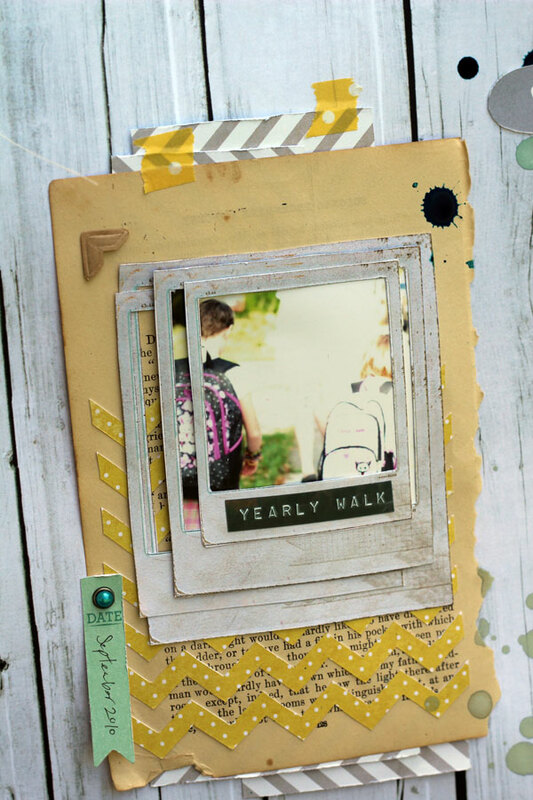 I layered the polaroid frames over old book pages that I adhered the chevron cut-outs over. The whole layout is on a background patterned paper of this awesome woodgrain pattern, also from the MME Bright Side collection. Supplies: patterned paper (My Mind's Eye); brad (My Mind's Eye); misting ink (October Afternoon); photo corner (Canson); punch (American Crafts); tag (the Paper Company); pen (Sakura). Love what you did with the polaroid frames! And I'm with you regarding the wood grain paper; I've hoarded so much of it, that I have a separate vertical storage bin just for woodgrain in every shade and color :) It's so versatile as a background. P.S. Thanks for your sweet email/comment on my blog. It was a sad sad day for me when you announced on your previous blog that you're going back to school and will not be scrapping. Your return was cause for celebration! I've made myself a huge cup of tea and spent over an hour looking through your work...inspiring! just browsing your blog...I love all of your creations. Those paper bows are so cute. You should sell them! I love how you used so many different cut elements here. The polaroids stacked resemble a book, and tie in really well with the book pages underneath. Your pages are so tender and sweet too. TFS! That polaroid technique is awesome! Fantastic LO.